I know I've been going on and on about this party for our friend, but it was fun and beautiful and isn't it nice to go to a party for your friends that doesn't include balloons, paper plates or tacky pizza boxes? 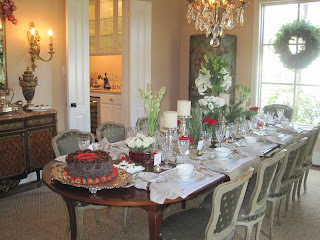 We (Anthea, Shannon and myself) wanted to have a beautiful party for our friends birthday and we believe it was a success. 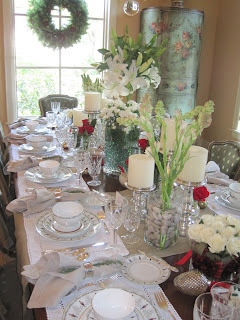 Sharon was happy, the table was pretty, the food was beyond yummy and the guests were precious. 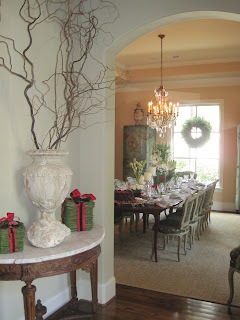 To set our table we started with very basic burlap table runners (you've seen me do this before) turned the width of the table instead of the length (again I have done this before). 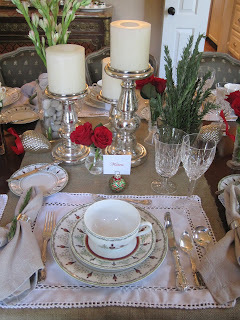 Then we layered with white linen place mats and Anthea's beautiful Christmas china (with it's delicate nutcracker border). No pretty party is complete with out the silver and crystal so of course out it came to take it's place of honor on our table. We all seem to be in love with mercury glass and so out came the mercury glass. Peak at the napkins (pottery barn) inside the napkin ring is a sprig of rosemary. Make a table beautiful with the things you have and love, nothing works better. 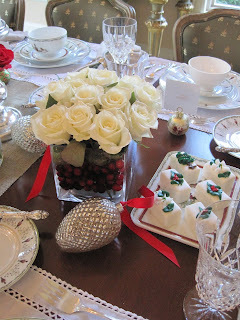 Roses in cranberries, and again mercury glass ornament. 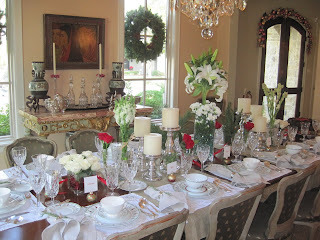 Table from another angle, isn't Anthea's house beautiful. It's amazing. We should all have a cake with our monogram at least once. 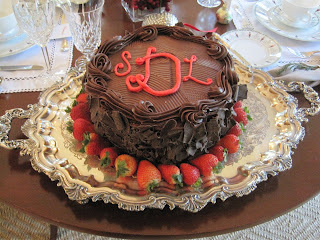 Sharon prefers chocolate, so here is her special cake, monogram and all. We watched all our details and worked to make our friends day special. What do you think? Our menu: Cream of Mushroom Soup (posted), Yakish Bakish Salad with Beef Tender and Parmesan Crisp with chocolate cake. I've posted cream of mushroom soup and to be totally honest we didn't make the cake, but the salad, beef tender and Parmesan crisp we did. If you all want the recipes send me comments and I'll do a post on it. I am so curious about "Yakish Bakish Salad"... Do tell!